The world is transforming from traditional to digital form. New technology is revolutionizing the world. Google forms are one of the most prominent applications available over the internet. You don’t need to use the traditional paper to create an online survey. 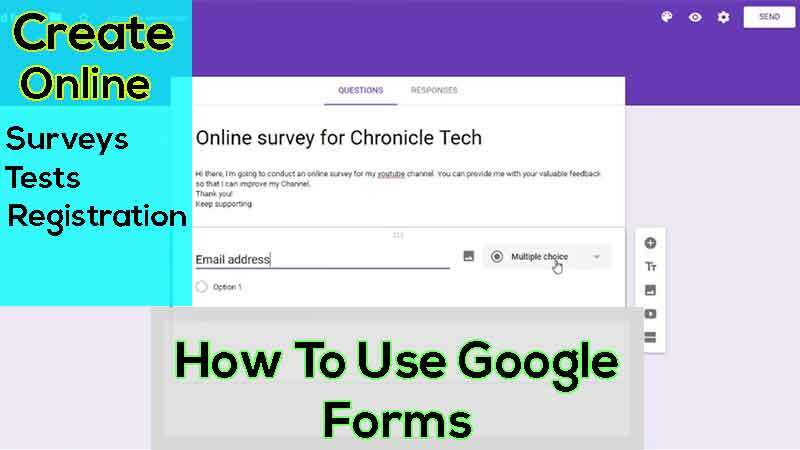 You can use google form to create an online survey and this article will discuss How to create and use Google Forms step by step. Let’s discuss What is Google Forms by explaining the simple definition of Google Forms. Google Forms is a Web application used to designs different types of forms for data collection purpose. Everyone can access this application over the internet for free. You can use to make surveys, quizzes, or event registration sheets using Google forms. Google forms have a wide range of applications in the modern era of the internet where people are moving from tradition surveys to digital surveys. You don’t need to use paper sheets to make a survey. All you need is to simply sign up to your Gmail account and visit the link. The data collected by Google Forms is secure and typically the data is stored in the spreadsheet. Google Forms deliver a fast and efficient way to create an online survey. The key feature of using Google forms is you can collect the response in an online spreadsheet. During the survey, you can view each response in a single row of a spreadsheet, with each question shown in a column. Google Forms is also very useful in gathering information regarding meetings and conferences. If you are a CEO or manager in a company you can easily collect information and response from your attendees. You can collect personal information like names and contact information for attendees. The day of a meeting, survey people to streamline your lunch order. After the meeting, use a survey to get the response on conference sessions and gather ideas for enhancement. 1. Anyone can design Google Form on the internet. You only need to have an active internet connection and a Google Account. 2. The creator of the Google forms can share it with the community around him and asks them to fill it out. 3. All the Google Forms responses are saved in an Excel The excel file is stored in Google Drive. 4. Once you’re done gathering responses, you can close the form and download the results. Just like almost all other Google Services, forms can be customized a lot. 24 different themes with myriad colors are offered by Google, and each of them can be customized to meet your aesthetic requirements. You can make questions compulsory or optional. One neat tool I liked is data validation – you can check set parameters for the data to be accepted to prevent trolls from creating useless records on your form. A Google Forms is an easy and efficient way to collect useful information associated with meetings or conferences. Easily and efficiently Create your survey and invite respondents by email. Simply send the survey link to your contact list via email or any other service. People can answer your questions from any web browser – including mobile smartphone and tablet browsers. The purpose of Google forms is to provide its users with efficiency and reliability. You can create a with few clicks: Google released a “one-click” Chrome Web Store app to generate the Google Form on October 23, 2013. Teachers can easily conduct tests for their students using Google Forms tool. After all the students have taken the test, the teacher can take the test attempting all the questions with correct answers – using a simple excel macro(comparing strings). You can complete correcting all the answers in less than 15 minutes. The efficiency in using and submitting Google forms makes it optimal for small businesses as a feedback channel. Since it is backed by Google, and we know well about the services of Google. You’ll have 99.999% uptime and unlike other online form options. Google Forms is completely free, and you can receive as many responses as you want – no annoying messages saying “Pay $$ to continue accepting responses”. Let’s have a look at how to design and use Google Forms. We will be going through the process step by step. First of all, you need to visit Google Forms. You will find different services on the top menu, click the Forms. After clicking Google Forms, you need to click on the blue button, Go to Google Forms. You will be redirected to a new page and you can choose a build in the template but I’ll be choosing a blank page. Here we will be designing an Online Survey for my Youtube channel using Google Forms. Here I’ll be giving a tittle to our online surveys. After giving the title, I will be writing a short description that will describe the purpose of our online survey. You will find a button “Multiple choice”, click that button and you will find a drop-down menu. You can select different options from drop down menu. Click the Short answer. Ok, you have done with your first question. Next, click the plus sign on right side of the form. A new blank form will appear and you can put another question. We have put the short answer in all the above screenshots but next, we will adding multiple choice. Select multiple choice from the drop-down menu. Next, add multiple choices, I will be adding School, college, and University. Next, we will be selecting a linear scale. Add digits numbers to the linear scale. I will be selecting from 1 to 10. Next, we will be checking the preview of our form whether it’s working properly or not. Click the eye sign on the upper right side. Here is the preview of our form we have just designed. We can change the color of the theme by clicking the sign on left side of eye sign. I just change the color from blue to pink. After completing the designing process for Google Forms, we will discuss How to use Google Forms. After the desiging of the Google From the form will be ready to use. You can click the send button to send the form to your community. A popup will open up and you will find three options to share the form with your community. We will be using the email option. You can also get a link by clicking the link button. The third option is to embed the code within your website or blog. You can check or uncheck the box “include the form in the Email.” If you will check it the user will be able to find the form within his email account and he will not need to visit the Google forms on Google server. Here I will be sending the form on one of my Email address. I just type the Email with subject and message. Click the send button. Ahan, I have just recieve a new mail in my Gmail account. It is something like an online survey form. Isn’t it the same survey form that we have just designed! Let me click “Fill out this Form” Button. Next, I’ll be filling out the details I have been asked in the form. Afte filling out all the details, I will click submit button after passing through captcha. Ok, I have just filled the form and submit it. The admin or owner of the form will quickly get my response by clicking the response button on the main page. That’s it! We have complete the tutorial about What is Google Forms and how to use Google forms. I hope this article will help you out in designing the Google forms for survey or other purposes. Feel free to ask me any question if you have. Don’t forget to share this article with your friends and fellows. Join the digital revolution and make an easy and efficient survey using Google forms.